It's a great time of year to see most of our native owl species. Tawny Owl. Image by Laurie Campbell. The summer months are a great time to get a good view and even perhaps some photographs or film of owls. During this time the owl chicks are still reliant on their parents for food whilst they are learning to hunt for themselves. This means the adult owls need to catch greater numbers of prey which in turn means they are out and about for longer periods. The light evenings lend themselves well to sitting outside, waiting and watching with a nice glass of wine or hot cup of tea. Children would love the excitement and the sense of adventure of staying up late to listen for, and perhaps catch a glimpse of, an owl. For the best chance of getting to see an owl it’s best to do a bit of research first. Different owl species prefer different habitats and it is a common misconception that owls only come out at night as some, like the Little Owl, are diurnal, which means that they are active and hunt during the day. 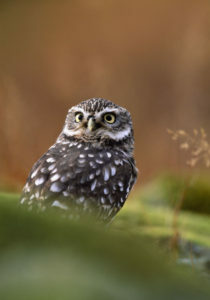 There is a handy guide at the bottom of the page with descriptions of UK owls, their habitat and when the best time of day to see them is – use this as your starting point. Local knowledge is often a much over looked resource, by asking around and contacting local wildlife groups you can get a good idea of what owls are present in your area. 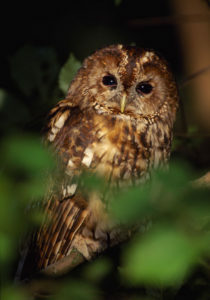 If you hear the well known owl call of ‘twit – twoo’ at night then you may be lucky enough to be able to get a sighting of the Tawny owl from your own garden. Barn Owl. Image by Laurie Campbell. Once you have a fair idea of which owls are in your local patch you are ready to try and spot them. Choose to walk or sit somewhere that owls are seen or heard regularly and make sure you take a torch, then it can just be a case of waiting patiently but if you have fidgety children or just lack patience then you can try this sneaky method to make the owls come to you! This works best for Tawny Owls and the idea is to pretend to be another owl by mimicking the owl’s call. Putting you hands together to make an airtight cup and blowing through your thumbs is supposed to be the best way of doing this but after hours of practice I cannot do it so just mimicking the twit-twoo sound should also work. The sound of another owl in their territory is bound to arouse the interest of the resident owl and they will come for a nosey so have your torch ready. Please remember to respect the birds and only perform this trick once so that the owl can then get on with the business of hunting and can be left in peace. The UK has six or seven naturally occurring species of owls depending on whether you count the European Eagle owl as naturally occurring, but it is living and breeding here in the countryside. The Hawk and Owl Trust has a wealth of information regarding UK birds of prey and they have kindly provided us with brief descriptions of the UK’s owls. To see the full descriptions of all birds of prey in the UK and to get more information about the Hawk and Owl Trust’s conservation and educational efforts please go to the Trust’s website. 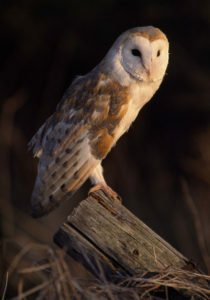 Barn owls (Tyto alba) are very pale and may be seen at dawn and dusk. It is largely nocturnal but can be seen at dusk and dawn; sometimes hunts during the day in winter and during the breeding season when feeding young. The barn owl is found on mixed farmland with hedges, copses and areas of rough grassland. This owl occurs throughout England, Wales and Northern Ireland; north of the border it is absent from central, north-east and the far north of Scotland and the outer Hebrides, Orkney and Shetland. Tawny owls (Strix aluco) are the owls most often heard calling during the night. Britain’s most common owl, though more people know its toowhit, twowoo call than have ever seen one. Tawny owls are happy to live close to people in cities and towns, as well as in the countryside. The tawny owl is principally a woodland bird, but also occurs in farmland with plenty of trees and overgrown hedges. It is often found in urban parks and suburban gardens with mature trees. It is recorded throughout England, Wales and Scotland but does not occur in Ireland or most of the islands surrounding the UK. LIttle Owl. Image by Laurie Campbell. Little owls (Athene noctua) are active during daylight. The smallest owl in Britain, it is often seen during the day perched on a post, telegraph pole or exposed branch. This owl is mainly found in farmland, around farmsteads and villages. The long-eared owl (Asio otus) is a very secretive bird that is often overlooked. The long-eared owl is smaller and slimmer than the tawny owl. 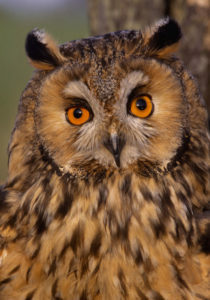 Long-eared owls are mainly found in conifer woodland on the edge of lowland heaths. They also occur in copses and thick hedges and belts of trees in open farmland and around rural settlements. Long Eared Owl. Image by Laurie Campbell. This species is widespread all year round in suitable habitats in the north, east and midlands of England, north Wales and southern Scotland. It also breeds further north in Scotland as a summer visitor. It is scarce and localised in south-west Britain. Short Eared Owl. Image by Laurie Campbell. 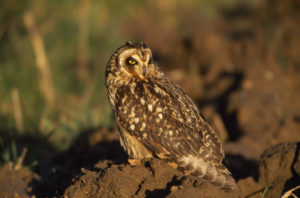 Short-eared owls (Asio flammeus) nest on the ground and are active during daylight hours. Our most diurnal owl, it is often seen sitting on a post or quartering open country. The short-eared owl is found on heaths, grass moors, marshes and sand dunes; in winter it is particularly found on coastal marshes and adjoining farmland. This species is resident in the north and east of England, north and west Wales and the south and east of Scotland. Summer visitors breed in the Highlands and west coast of Scotland. Scottish birds and those from Scandinavia winter in southern England and Northern Ireland. The large white snowy owl (Bubo scandiaca) was made famous as Harry Potter’s owl, Hedwig. The male snowy owl is almost pure white, while the female is white, fairly heavily barred and speckled in dark brown or grey. These owls are found on tundra and high fells, often near the coast. In Shetland they bred on grass moorland with heather, rock outcrops and scattered boulders. The birds that stay during the summer mainly occur on the islands of northern Scotland. The species is recorded more widely in winter, especially in invasion years when their prey has crashed in Scandinavia. For more information regarding Owls in the UK please have a look at the Hawk and Owl Trust website.